Birth City: Puerto Ordaz, Venez. In 2005, Gonzalez signed with Cubs (see Transactions below). In 2012, Baseball America rated Marwin as the 20th-best prospect in the Astros organization. In April 2012, Marwin spent three days away from the Astros on paternity leave for the birth of his first child, a daughter named Aliana. Astros manager A.J. Hinch views Marwin as a starter, even though he might be the most valuable bench player in baseball. That's because Gonzalez usually found his way into the lineup in 2015, whether it was bringing consistency to first base, adding a righthanded presence to the outfield or filling in elsewhere following an injury. Gonzalez wound up starting 86 games in 2015, seeing time at first base, shortstop, third base, second base and left field and had a career year at the plate in the process. Gonzalez's worth goes beyond his versatility and ability to switch-hit. Because he can do so much, the Astros can carry an extra pitcher, giving Hinch 13 arms at his disposal. They did that for much of the 2015 season. November 2005: At age 16, Gonzalez signed with Cubs' scout Hector Ortega as a free agent, out of Venezuela. December 8, 2011: The Red Sox chose Gonzalez out of the Cubs organization in the Rule 5 Draft. 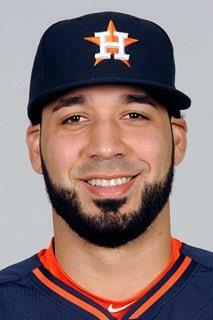 Boston then dealt Marwin to the Astros, in a trade for Marco Duarte. January 15, 2016: The Astros and Gonzalez avoided arbitration, agreeing to a one-year deal worth $2 million. Nov 3, 2017: The Astros picked up Marwin's club option for 2018, which was $5.125 million. Oct 29, 2018: Marwin chose free agency. Feb 22, 2019: Gonzalez agreed to a two-year, $21 million contract with the Twins. Gonzalez has power to the gaps. He is an impressive switch-hitter. Marwin chokes up on the bat and has good bat control, consistently making contact from both sides of the plate. 2015 season: Gonzalez set career highs in games (120), plate appearances (370), batting average (.279), slugging percentage (.442) and home runs (12). April 24, 2016: Another homer, another solo shot for Marwin Gonzalez. Gonzalez extended his Major League record by hitting his 25th career homer—all of which have been without anybody on base. No other hitter in the history of baseball has tallied more than 11 Major League home runs without bringing someone else in with him. Todd Dunwoody, the second-place finisher in this statistic, spent more than 400 of his 986 career plate appearances as a leadoff man, but Gonzalez has started just three games atop the lineup in his career (as of April 25, 2016). Marwin finally hit a home run with a man on base, ending his Major League record streak at 25 solo shots in the Astros' 6-3 win over the Mariners on May 6, 2016! Gonzalez cranked a two-run homer just beyond the right-field wall in the second inning, giving the Astros a 3-0 lead. It was far more than his second home run this season or the 26th of his five-year career. No other hitter in Major League history has tallied more than 11 home runs without bringing someone else in with him. "It feels good to get more than one RBI finally," he said. "But the more important thing was it helped us win today." Todd Dunwoody, the second-place finisher in this strange statistic, spent more than 400 of his 986 career plate appearances as a leadoff man, which partially explains his presence, but Gonzalez has rarely started atop the lineup. May 3, 2017: Gonzalez became the first player in the modern era (since 1901) to homer in four straight starts, each at a different position. Those starts were at second base, third base, left field and first base. As of the start of the 2019 season, Marwin's career Major League stats were: .264 batting average, with 650 hits and 76 home runs with 292 RBI in 2,466 at-bats. Gonzalez signed with the Cubs as a shortstop. Marwin is a very capable defender at multiple positions around the infield. He can be a valuable utility man. He has played six positions during his career. The only positions he hasn't played are catcher and right field. And, in a pinch, he could probably play there too. Marwin has only marginal base-stealing ability. He steals a handful of bases every year. He is an average runner who is above average once under way. June 7-July 15, 2012: Gonzalez was on the D.L. with a bruised right heel.